Starring Jean Gabin/Pépé le Moko, Mireille Balin/Gaby, Line Noro/Inès, Lucas Gridoux/Slimane, Gilbert Gil/Pierrot, Saturnin Fabre/'GrandPa', Fernand Charpin/Régis, Marcel Dalio/L'Arbi, Gaston Modot/Jimmy, Roger Legris/Max, René Bergeron/Inspecteur Meunier, Paul Escoffier/Chief Inspecteur Louvain. 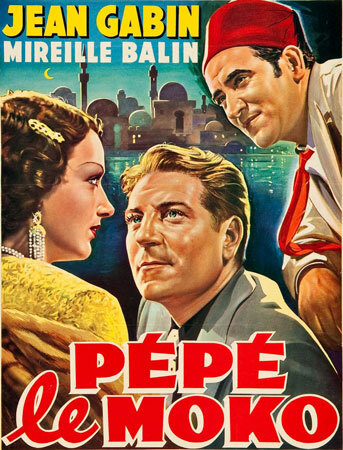 Pepe Le Moko is an early film noir classic, told as only the French can, about a man fatefully caught between the divergent worlds of truth and illusion. 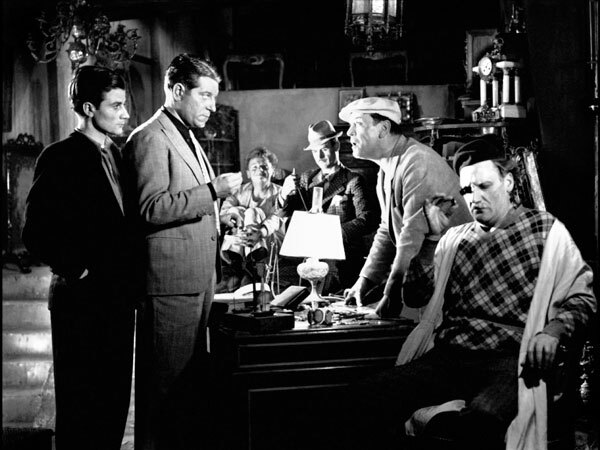 As the film opens, the Paris police cops are playing a waiting game, arguing among themselves about which is the best way to lure one suave gangster, Pépé Le Moko, out of his comfortable lair in the Casbah. It's been a two year wait, and some of the boys want to rush in and capture him once and for all. 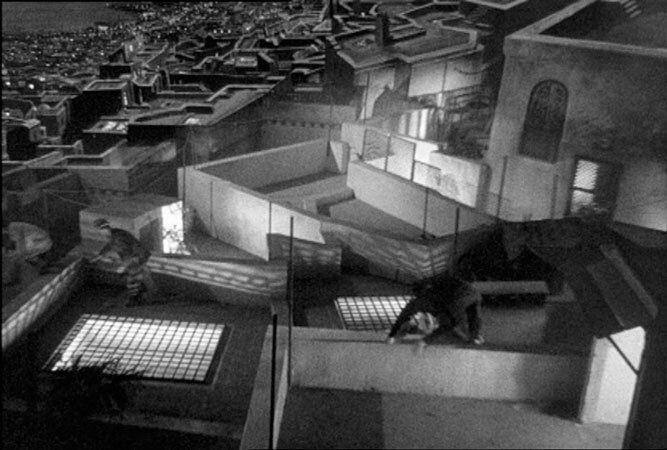 The head of the police stands before a map of the area and scoffs as a mesmerizing montage of images unfolds over his words: "The Casbah is like a labyrinth. .. From the air, it is like a teeming anthill, a vast staircase where terraces descend stepwise to the sea. Between these steps are dark winding streets like so many pitfalls. They intersect, overlap, twist in and out...to a jumble of mazes - some are narrow, others vaulted. Wherever you look, stairways climb steeply like ladders or descend into dark putrid chasms and slimy porticos...Dank and lice-infested - dark overcrowded cafes, silent, empty streets with odd names. A population of 40,000 in an area meant for 10,000 - from all over the world...and girls of all nations, shapes and sizes. The tall...the fat...the short...the ageless...the shapeless. The houses have inner courtyards, which are like ceilingless cells that echo like wells and interconnect by means of the terraces above - they're the exclusive domain of native women...They form a city apart, which, step by step, stretches to the sea. Colorful, dynamic, multi-faceted, boisterous - there's not one Casbah but hundreds - thousands! And this teeming maze is what Pépé calls home. Catching him is no piece of cake." He speaks of him with grudging respect, but one Officer Silmane and his world-view of Pépé's predicament stretches beyond that. Much like the opening narration of the Casbah, he alone understands that one could be referring to Pépé Le Moko himself. Lucas Gridoux’s Slimane, ubiquitous and cunning, moves like a Gallic Nosferatu, and yet his peers barely acknowledge his presence. They dismiss him as stupid and yet he believes his skill will allow him to outwit Pépé. We already know Pepe's fate, for the Casbah is an intricate spider web and he's already caught. And we're also aware that Slimane will be the psychopomp throughout the film, ushering Pépé from his limbo existence in the Casbah out into the active world of harsh reality that he's been avoiding. The action shifts to Pepe's gang, also in the Casbah, nervously hunched over some stolen gems. It's clear that they're weary of being stuck in such a place, but they wouldn't think of leaving Pépé - and it's not hard to see why, since his easy grace and careless charm ensnares everyone. Dressed in white, he quietly observes the mistrustful Carlos, jaunty Jim, giggly Max and hot-headed Pierrot, who always seem to be arguing. Their small group mirrors an even larger network in the Casbah, where an efficient underworld looks out for each other against the common enemy of an ever-present police departement. Pépé keeps his cool, deals harshly with squealers and is considered the king of the Casbah. His uneasy love-hate relationship with Slimane is an ironic one, as Pépé knows too well that his days are numbered. He even helps him extend the hunt, because their bromance is forged by their ambitions - Pépé's to remain out of jail and Slimane to see that justice is done. After a fruitless clash between his gang and the police, informer Regis suggests that he fabricate a story to use Pierrot - who Pépé treats like a brother - in order to lure the kingpin out into the open. Delighted at his eagerness to betray Pépé, Slimane observes, "I'm laughing at you - selling out your friends retail." Slimane deals in the hard currency of honesty, and this impresses Pépé, much to the chagrin of his crew. During the raid, Pépé has a chance encounter with play girl Gaby, their eyes locking in a transcendent moment which is almost a religious experience for them. Her glittering jewels highlight the falseness of her own life, which have been in the pursuit of comfort and luxury. 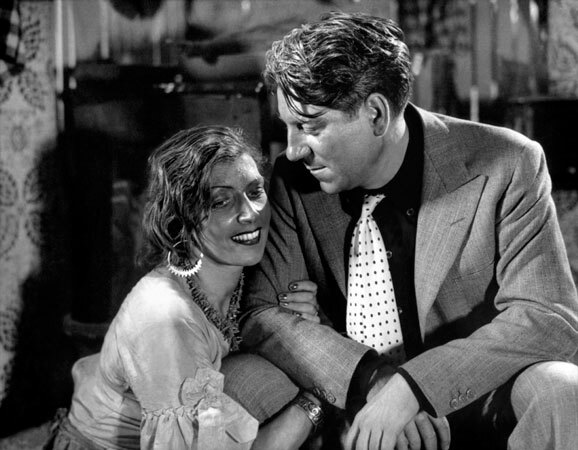 Here director Duvivier emphasizes her immobile face in tight shots, and this false, smooth mask seems to mirror Pepe's own calculated personality. He seizes upon this romantic desire for her, as she represents a place that literally doesn't exist, except in his dreams. Surrounded by her wealthy friends out slumming for the odd thrill, she comes to symbolize Paris for Pépé, who desperately wants the promise of a new rebirth. "Women will be your undoing", Slimane prophetically counsels Pépé. He readily admits that he associates the Casbah with his Gypsy lover, Ines, whose clinging has turned more obsessive as he emotionally disengages. Pépé takes it all in with the typical European shrug. Like old friends, they chat about love and life, constantly invading each others physical space. Throughout the film Slimane cradles a stick, which he uses almost as a third arm - using it to emphasize a point, as a gentle threat, or to keep others at a distance. This distance - both physical and emotional - further highlights the similarities between the two men. Poor Ines represents the Casbah, where everything looks and feels the same. The contrast between the untouchable Gaby and the wildly disheveled Ines makes it even more obvious that Gaby has already won Pepe's heart. His interactions with Ines are almost an afterthought, as his disinterest signals that he's just marking time until he can escape the claustrophobic hideout - and her. Slimane will play both women against Pepe, aware that their hidden agendas will lead him out of his comfort zone for that one moment of distraction that he needs. This urbane spider, knowing that the tension of a two-year wait is too much for Pepe's gang, will also set in motion several sub-plots to further weaken Pepe's circle of support. 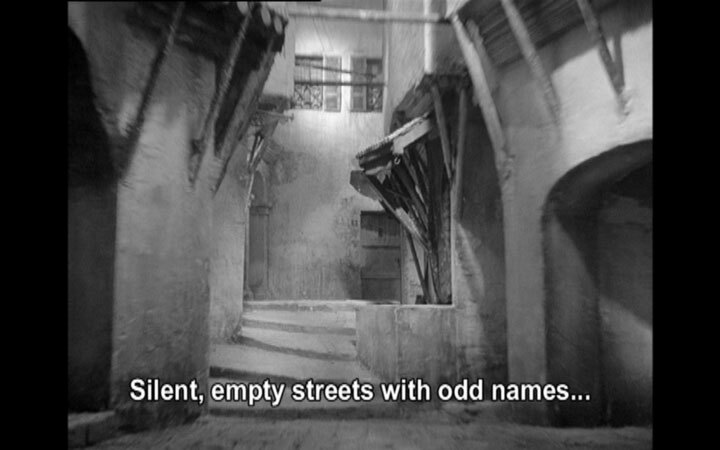 The unfolding noir drama of Pepe Le Moko is played out against the ash-white buildings and narrow alleys of the Casbah. 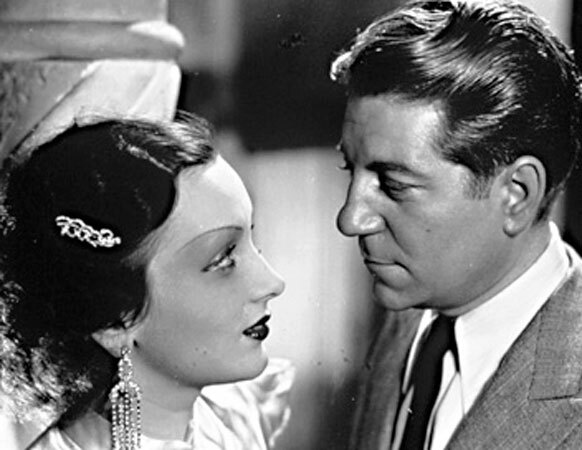 Watch this wonderful film for the love story portrayed by Jean Gabin and Mireille Balin, as they burn up the screen, but the most fascinating character will always be Slimane and his friendship with our existentialist hero. And of course, watch the American remakes, Algiers (1938), starring Charles Boyer and Hedy Lamarr (in her U.S. film debut) and Casbah (1948), starring Tony Martin and Yvonne De Carlo. 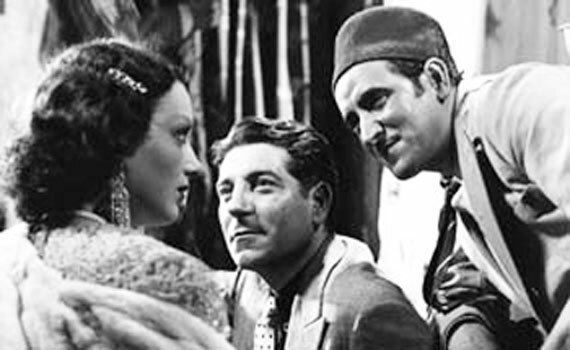 Although not one of Boyer’s favorite films, Algiers nabbed four Academy Award nominations and boasts an impressive crew, including a screenplay by James M. Cain/John Howard Lawon and Cinematographer James Wong Howe. Producer Walter Wanger snatched up every copy of Pepe le Moko, to order to prevent any competition - or comparison - with the French original. 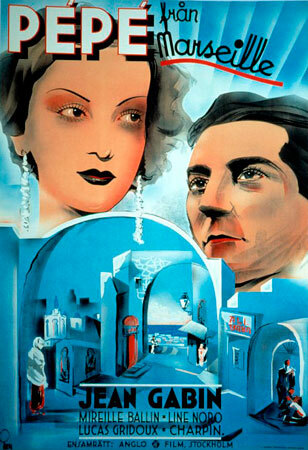 Algiers is a tepid version of the French masterpiece and Casbah was shot - as a musical!- that was quickly forgotten. When a film is remade, the copy brings the original into sharper focus. 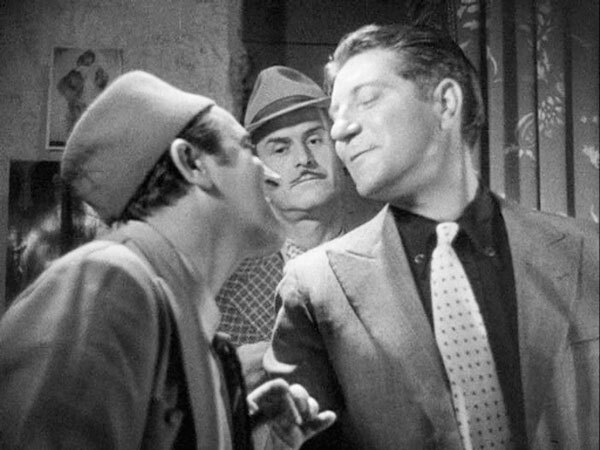 Watching the three versions of Henri La Barthe’s novel will forever highlight that Jean Gabin is the definitive Pepe le Moko - and as they say - imitation is the highest form of flattery.